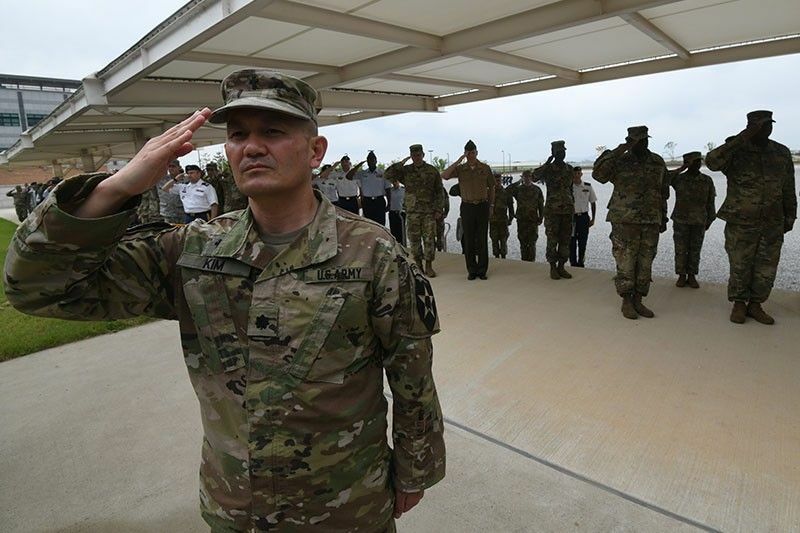 In this file photo taken on June 29, 2018 US soldiers salute during a grand opening ceremony of the new headquarters building for the United Nations Command and US Forces Korea at Camp Humphreys in Pyeongtaek. The United States has no intention of pulling troops out of South Korea as it negotiates a nuclear accord with the North, the US representative on talks with Pyongyang said January 31, 2019. "We are not involved in any diplomatic discussion -- full stop -- that would suggest this tradeoff. It has never been discussed," Stephen Biegun said when asked during a talk at Stanford University about the prospect of a pullout. WASHINGTON, United States — A US negotiator called Thursday on North Korea to provide a detailed account of its weapons to seal a peace deal, saying President Donald Trump was ready to offer a future that includes diplomatic relations and economic aid. "I think most of you know where the location is. I don't think it's a great secret," he told reporters at the White House. "We've made tremendous progress with North Korea," said Trump, whose June summit with Kim in Singapore was the first ever between leaders of the two countries that never formally ended the Korean War. The meeting produced a document in which Kim pledged to work toward the "denuclearization of the Korean peninsula." As skeptics voice worry that Trump is overly eager to make a legacy-building deal and enjoy the spotlight of meeting the reclusive leader again, the US special representative on North Korea, Stephen Biegun, said the administration is "clear-eyed" and prepared for contingencies if talks fail. On Tuesday Director of National Intelligence Dan Coats told the Senate Intelligence Committee that "North Korea is unlikely to give up all of its nuclear weapons and production capabilities," an analysis counter to Trump's position that there is "a decent chance" of the North giving up its nuclear weapons. Biegun painted an upbeat picture at ending decades of hostility despite repeated failures in the past, saying that Trump "is unconstrained by the assumptions of his predecessors." "I have this perfect outcome moment where the last nuclear weapon leaves North Korea, the sanctions are lifted, the flag goes up in the embassy and the treaty is signed in the same hour," Biegun said at Stanford University. "Now that's an ideal, I know, and these things are going to move haltingly along different courses. But they can also be mutually reinforcing," he said. "Before the process of denuclearization can be final, we must have a complete understanding of the full extent of the North Korean WMD and missile programs through a comprehensive declaration," Biegun said. Rejecting criticism that the Singapore declaration was vague, Biegun said that Kim has committed -- both at the summit and in follow-up talks with Secretary of State Mike Pompeo -- to "the dismantlement and destruction" of all plutonium and uranium sites, not only its signature Yongbyon facility. North Korea watchers believe the regime is foremost interested in easing international sanctions, which were tightened in 2017 after the regime's missile and nuclear tests raised fears of a new war. Biegun said Trump was prepared to assist Kim in building "a brighter economic future" and gave nuance to the repeated US insistence that it will not ease sanctions until denuclearization. "We say we will not lift sanctions until denuclearization is complete. That is correct. We didn't say we won't do anything until you do everything," he said. Biegun assured North Korea that Trump -- who in 2017 threatened in front of the United Nations to "totally destroy" the country -- wanted to end the state of war. "We are not going to invade North Korea. We are not seeking to topple the regime," he said. "We are not involved in any diplomatic discussion -- full stop -- that would suggest this tradeoff. It has never been discussed," Biegun said.